Originally published in the late 1960s and currently in its 42nd edition, this is a new English tradition of a modernist picture book classic. 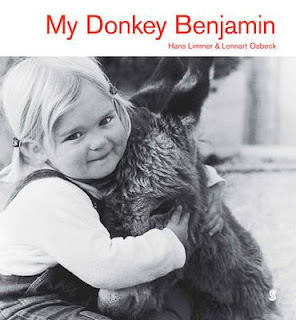 Illustrated throughout with clear black and white photographs, My Donkey Benjamin is told from the point of view of blonde-haired Susanne whom everyone calls Susi. Benjamin, who Susi calls Ben, is small like her, a baby donkey found by the girl and her father alone among rocks on Rhodes, near the Mediterranean Sea. Angelika, Susi’s baby sister, squeals with delight when toddler Susi and her dad bring home the donkey. The book’s photos show the interior of Susi’s house with its white-washed walls and pebble floor where Ben seems to be allowed to have free reign. Susie lies across Ben, washes his face from a tub, ties white bandages on his head, and romps through the house. When the two are outdoors, the reader can see the dozens of Mediterranean houses and the sea beyond. At night Susi and Ben fall asleep in a makeshift bed – indoors, of course. One day, Ben disappears, and of course Susi goes in search of him, and then the two are lost. Of course the book ends happily, both greeted at home by Mum and Dad. This is a beautiful and engaging picture book sure to be enjoyed by small children being read to by their mum or dad.